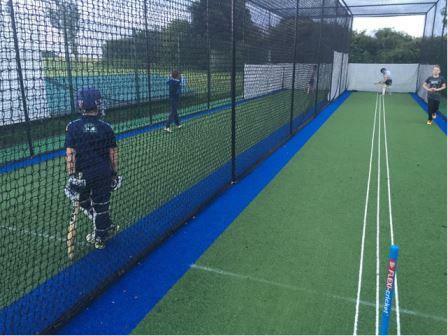 As part of a raft of ground improvements to serve its thriving membership, Sheffield side Hollinsend Methodist CC was keen to invest in a first-class synthetic cricket practice nets facility. 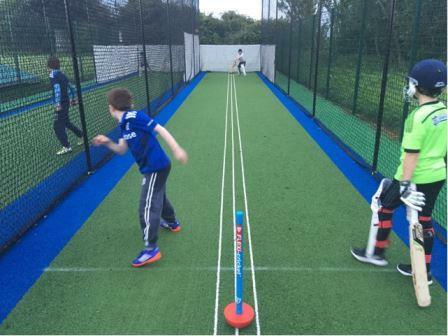 Having secured significant funding from Sport England’s Inspired Facilities stream to support the project, the club went on to research the various ECB approved non-turf practice system suppliers in the marketplace. total-play was finally selected following a site visit to nearby Askern Miners Welfare CC where the company had recently installed a similar non-turf cricket practice nets facility; with the client leaving impressed by the quality of the installation and feedback from satisfied Askern Miners representatives. With total-play responsible for everything from system design to groundworks, installation to landscaping, the project got underway during a particularly wet phase of wintery weather. Initial excavations were conducted sensitively to minimise disruption to the access route and surrounding natural surfaces, with the groundworks team able to lose some spoil generated by initial excavations on site to level areas of the outfield. This stage of works also included the construction of a catchment drain to ensure any rainfall coming from higher ground is redirected safely around the facility and into local outfall to avoid damaging the playing surface. Groundworks complete, the team moved onto the installation stage; building the facility around a surface constructed to total-play’s ECB approved tp365 non-turf pitch design. The specification of the fully netted and enclosed system also included 2.4m high security fencing and a synthetic walkway around the entire facility created by increasing the size of the base construction. Other bespoke elements comprised a 3x4m carpeted entrance threshold with double leaf access gates; extra depth aggregate base in excess of 200mm to ensure durability and longevity; black HD Protection Tunnel ‘cocoon’ nets hung on black powder coated steelwork; full ‘wrap’ batting curtains; conduit installation to provide electric service for bowling machines and extra sight screen curtains for the outside of the facility to aid the batsmen using natural surfaces to either side of it. 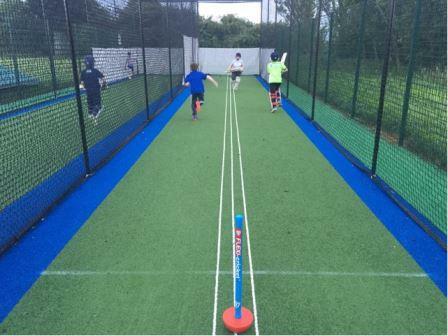 White training stump lines integrally woven into the system’s premium grade Wilton woven carpet in one of the two lanes complete the facility’s impressive specification. With the project completed in April 2016, despite particularly inclement weather throughout, the club has been making full use of its facility throughout the season.